Airing on BBC radio for the first time since it was originally broadcast in December 2012, Neil Tennant’s Smash Hits Christmas includes an interview with Toyah during this fascinating 30 minute special, discussing ‘Smash Hits’ in the early 1980s and also the memorable and iconic ‘Brave New World’ cover issue. 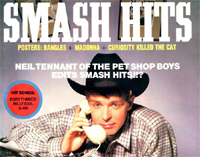 Neil Tennant had a life as a journalist before he became famous as a Pet Shop Boy. In fact, it was on a Smash Hits trip to New York that he had his big breakthrough with the record producer Bobby O. Here, 30 years after his first stint on pop’s most successful and inventive magazine, Neil recalls the golden days of Smash Hits. We hear from founder and legendary magazine maker Nick Logan, editors David Hepworth and Mark Ellen, writers Miranda Sawyer and Sylvia Patterson, and from regular Smash Hits cover girl, Toyah. We also sample a rare recording from the 1982 Christmas Flexidisc (a message from the stars) and probably Neil Tennant’s first recording – the music for a trailer advertising Smash Hits stickers. Producer: Susan Marling. A Just Radio Ltd. production for BBC Radio 4.